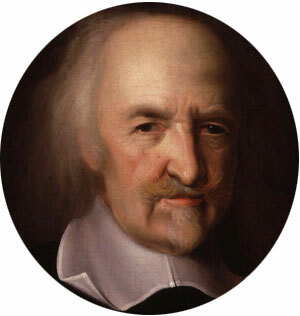 The prominent English philosopher Thomas Hobbes is considered by some historians as one of the prophets of the AI (Artificial Intelligence), primarily for his proclamation By ratiocination, I mean computation, in his 1651 book Leviathan or The Matter, Forme and Power of a Common Wealth Ecclesiasticall and Civil, commonly called simply Leviathan (see the frontispiece of the book below). 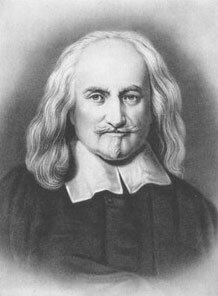 Thomas Hobbes of Malmesbury (April 5th, 1588 – December 4th, 1679) is best known for his political thought, and deservedly so, because his vision of the world is strikingly original and still relevant to the modern politics. His main concern is the structure of society and legitimate government, e.g. how human beings can live together in peace and avoid the danger and fear of a civil conflict. He poses fearful alternatives: we should give our obedience to an unaccountable sovereign (a person or group empowered to decide every social and political issue), otherwise we will face a state of nature, that closely resembles civil war—a situation of global insecurity, where all have reason to fear violent death and where rewarding human cooperation is all but impossible. 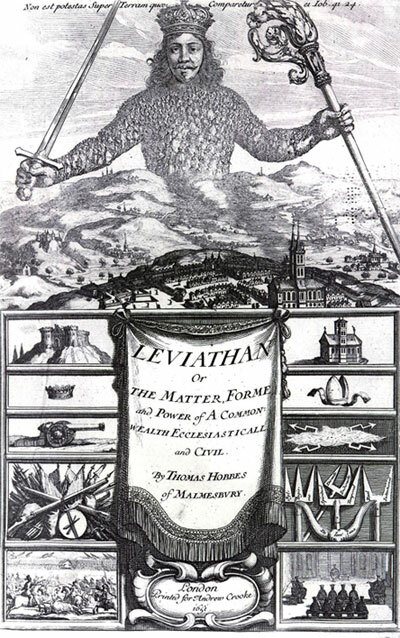 In the above mentioned book Leviathan, which was written during the English Civil War (1642–1651), Hobbes established the foundation for most of Western political philosophy from the perspective of social contract theory. First, thinking is mental discourse. That is, thinking consists of symbolic operations, just like talking out loud or calculating with pen and paper, except, of course, that it is conducted internally. Hence thoughts are not themselves expressed in spoken or written symbols but rather in special brain tokens, which Hobbes called phantasms or thought parcels. Second, thinking is at its clearest and most rational when it follows methodical rules—like accountants, following the exact rules for numerical calculations. In other words, explicit ratiocination is a mechanical process, like operating a mental abacus: all these little parcels (which, of course, need not stand only for numbers) are being whipped back and forth exactly according to the rules of reason. Or, in cases where the rules are being ignored or bent, the person is simply confused. When a man reasoneth, he does nothing else but conceive a sum total, from addition of parcels; or conceive a remainder, from subtraction of one sum from another… These operations are not incident to numbers only, but to all manner of things that can be added together, and taken one out of another. For as arithmeticians teach to add and subtract in numbers; so the geometricians teach the same in lines, figures,… angles, proportions, times, degrees of swiftness, force, power, and the like; the logicians teach the same in consequences of words; adding together two names to make an affirmation, and two affirmations to make s syllogism; and many syllogisms to make a demonstration. Hobbes obviously overstretched the metaphor of addition, but we can think at that after all these years. Hobbes also eagerly embraced the idea that reality itself is fundamentally mathematical: ultimately nothing but tiny moving particles. Hence he readily agreed that so-called sensible qualities (colors, odors, tickles, and the like) are not really in objects at all, but only in perceivers.